Hospital workers say that within minutes of waking, Mathyssen had effortlessly worked his way through several inpatient forms and an insurance claim. PARKER, CO—In what doctors are calling a true medical miracle, local construction worker Kal Mathyssen awoke from a week-long coma early Wednesday with the ability to fully comprehend his health insurance plan, sources at Parker Adventist Hospital confirmed. Mathyssen, who sustained a severe head injury after a fall at a nearby job site, reportedly stunned hospital staff and family members when he suddenly regained consciousness around 1 a.m. and began confidently filling out all the paperwork required by managed care company Aetna to receive the benefits guaranteed by his insurance policy. 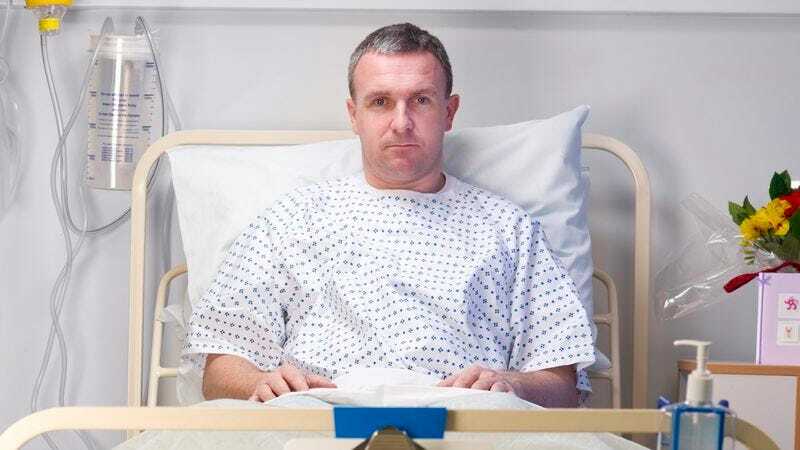 According to doctors, within minutes of waking up in the intensive care unit, the 38-year-old began to display an unusually strong grasp of his Aetna Preferred health plan. Astonished onlookers confirmed that after consulting his insurer’s website and listening to a series of recorded messages on a customer service line, Mathyssen determined he would be responsible for a $250 emergency room copay, the amount remaining on his policy’s aggregate family deductible, and the full sticker price of any non-formulary medications he may require during his recovery. In addition, several of Mathyssen’s family members said they had a difficult time believing that the man who emerged from the coma was the same person they had always known, pointing out that their relative, who has seldom made use of his Health Savings Account in the past, showed a rare ability to determine which bills he would be able to pay for with his HSA debit card and which nonqualified expenses he would have to pay for with his savings or, should that become depleted, through a monthly installment plan. Bedside sources said they were left shocked and speechless when Mathyssen later picked up his cell phone and not only reached the person he needed to speak with in Aetna’s benefits department, but also had a cordial conversation in which he appeared to follow everything the representative was saying, ending the call in less than five minutes with a reference number documenting the exchange. The physician went on to state that she expects Mathyssen to make a full recovery, and that he might one day even gain the ability to understand the paperwork he will need to fill out to file for bankruptcy once he is billed for his hospital stay.